The ink could be used to make cheap bracelets, stickers or headbands, the researchers say. Australian researchers say they’ve invented a cheap, inklike product that could be used to make wearable sun sensors to tell people when they’ve had too much. The ink darkens steadily when exposed to ultraviolet rays, and works when it is written onto paper that could be used to make, for instance, a bracelet, the team reported. “You can print this on anything — paper, plastic or anything,” Vipul Bansal, an applied chemistry professor at Australia’s RMIT University in Melbourne, told NBC News. The ink is based on a compound called polyoxometalate. When combined with other compounds, it creates a clear product that turns a steadily darker blue when exposed to ultraviolet radiation. It turns blue faster when exposed to UVB, the most damaging type of radiation, and more slowly in response to UVA, which takes longer to do its damage, the team reported Tuesday in the journal Nature Communications. 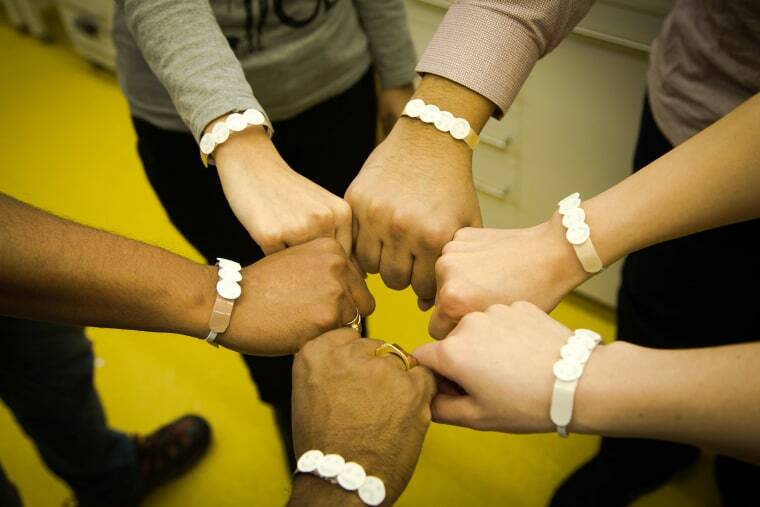 Bansal and his team created paper bracelets that people could wear to warn them of sun exposure long before symptoms of sunburn start to be felt. And it’s possible to customize the sensors for different skin types, using a filter. “We discovered that low-cost readily available transparency films can, in fact, act as ideal UV filters for this purpose,” the team wrote. The paper could be laminated to make it waterproof and sweatproof, Bansal said. Bansal has personal reasons for the research. “I have been struggling for many years to manage my vitamin D levels,” he said. His levels are low even when he takes supplements. Sunshine causes the skin to produce vitamin D naturally, but it can be difficult to know when you have received enough sun, and when you have received too much, Bansal said. Australia has the highest rate of skin cancer in the world and the UV index is part of daily weather reports, but the UV index is a one-size-fits-all forecast. It does not take into account skin tone, shade and other factors. A wearable device would allow people to customize their UV exposure, he said. It could be useful in colder climates, also. “People fail to understand that UV light is not hot. The amount of sun that you feel has nothing to do with the intensity of the sun or the heat of the sun,” Bansal said. His team is working to make a commercial product now. Currently, it costs about 3 cents to make a sensor, he said. “It should be affordable to the vast majority of the population,” Bansal said. Such a device could also be useful for people working around devices that generate ultraviolet C rays. These rays are filtered out by the sun’s atmosphere but are extremely toxic. UVC devices are used to kill germs in labs and other areas but must be placed so the rays do not fall on people’s skin. What Are the Most Common Skin Cancers? Skin cancer is by far the most common type of cancer, the American Cancer Society says. One-in-five Americans will develop skin cancer by age 70. In Australia, two out of three people are projected to develop at least one form of skin cancer. In the U.S. 3.3 million Americans are diagnosed every year with basal or squamous cell skin cancer —neither of which is particularly deadly if treated in time. Melanoma accounts for about 1 percent of skin cancers but is far deadlier. It kills more than 9,000 people a year in the U.S.